Founded in 1951, the United Daily News Group (UDN Group) has chronicled news and history made each day for more than 60 years. Looking forward, the UDN Group continues to move to digital convergence for sustainable operation of its journalistic endeavors, aiming to make Taiwan a better place. 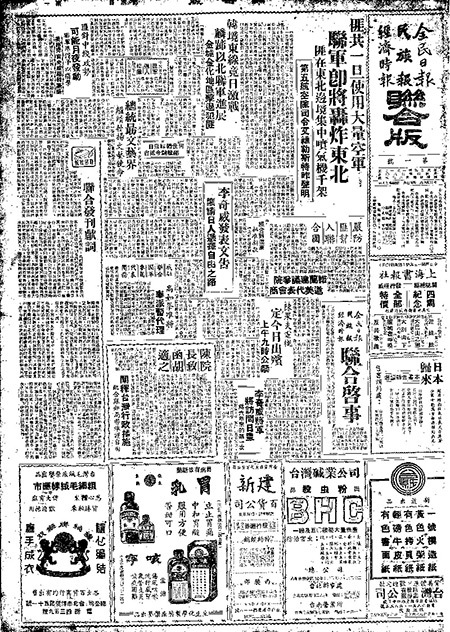 On September 16, 1951, the Min-Zu News (The People’s News), Quan-Min Daily (All Citizen’s Daily) and Jing-Ji Times (Economic Times) merged into the United Edition, which was the predecessor of the United Daily News (UDN). Circulation at the time was 12,000 copies, and by 1986 the number had topped 1.5 million, making UDN Taiwan’s largest newspaper that year. Currently Taiwan’s largest privately-operated Chinese-language newspaper group, the UDN Group publishes the United Daily News, the Economic Daily News, the United Evening News, and the World Journal, with editions published in North America and Southeast Asia. The UDN Group aspires to not just produce newspapers in Taiwan and for Chinese-speaking readers around the world, but be a news media group that provides content and information on various devices spanning newspapers, personal computers, mobile phones, tablets, and other devices that may appear in the future. Readers and users are also encouraged to express their own views and share content on UDN Group’s multiple platforms. For many years the udn.com website has continued to be Taiwan’s most popular news web portal that provides the finest news content. UDN Group spearheaded experiments in Taiwan’s media industry with multi-media narratives centered on infographics and data journalism. To celebrate its 60th anniversary, the UDN Group initiated the Vision Project in 2011 and re-defined its role as “Shaping Influence and Instigating Change.” With efforts to bring about constructive social changes via reporting and actions, the Vision Project has carried out many large-scale news projects with continual follow-up on further development of the reported issues. We believe that the Vision Project goes beyond reporting the news and pertains to the sense of responsibility and attitude that the media should hold. As has been the case for more than six decades, we look forward to being able to represent opinions of all walks of life while providing new viewpoints from public and private sector leaderships. The UDN Group has brought positive change to Taiwan, and strives to make Taiwan a better place. The UDN Group has mapped out a multi-faceted enterprise blueprint based on its core foundation in the media, including education, health, culture and creativity, e-commerce, events, and much more. With these business units other than media, the UDN Group is aiming to be more than a content provider but also life experience provider, from cultural exhibitions, performing arts programs to health forums, travel planning and publishings.